Many modern river delta environments are chock full of organic matter (think Louisiana swamp). Much of it is plant and other woody material. 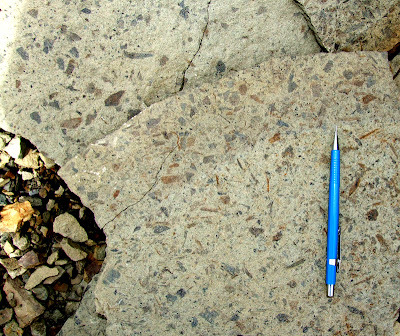 In some cases, this material is buried and remnants or evidence of it are preserved when the sediment lithifies. The photos above show the bedding plane view (looking down on top of the surface of sedimentary layer) of a deposit rich with organic detritus (i.e., pieces of stuff). A lot of it is preserved woody fragments. Also note the dark black flecks…this material is mostly carbonaceous shale, which is kind of like coal. Click on these to see the high-res versions. 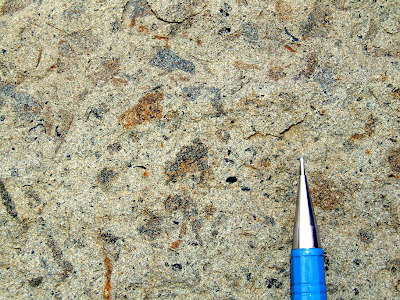 The organic detritus is abundant in thin (~1 cm) layers. 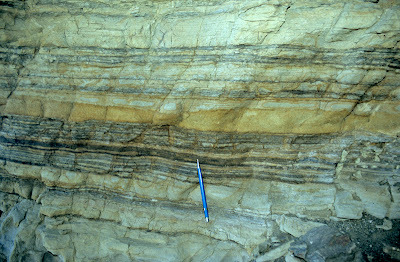 The photo below is a cross-sectional view where you can see the layering of the sedimentary rock. The darkest layers (the pencil is pointing to one) are dark in color because they are full of this organic detritus and coaly bits. But, wait, these are turbidites? It says so in the post label. How can you have all this terrestrial organic matter on the deep sea floor? In this case, this turbidite system is being fed by a delta. In the upper photographs, notice how broken up all the organic matter is. It has been ripped up and flushed off the delta environment and into the deep sea, where it was likely buried rather quickly. We find abundant organic detritus on the very tops of turbidite beds….this material is relatively light compared to the medium-grained sand and, therefore, is deposited after the sand as the flow slows down (ending up on top). The organic detritus-rich nature is, in fact, one of many lines of evidence telling us that these Cretaceous strata are delta-fed turbidite deposits.